Roy Kennedy, like many Aboriginal artists, came to art-making late in life. As he says, "I am living proof that you're never too old to learn". Kennedy studied painting and later etching at the Eora Centre in inner city Sydney. Etching is his preferred medium and one that has revealed his strength of vision as an artist. Kennedy's work shares many similarities with other successful Eora graduates, such as HJ Wedge and Elaine Russell. Like these artists, Kennedy has forged a distinctive style that contributes to the growing strength of Indigenous art practice in urban centres. Many of the senior artists working in the cities reflect on their younger lives growing up on missions in regional areas. 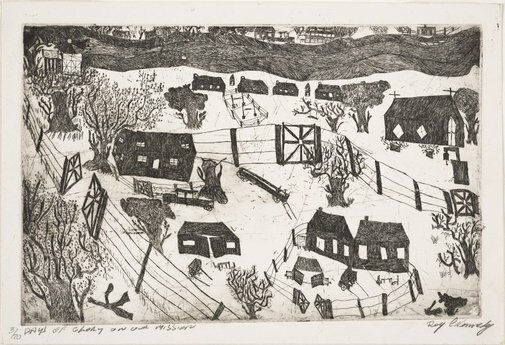 This series of prints recall Kennedy's life on Police Paddock Mission, where his family were moved when the mission his mother was born on, Warangesda, was closed in 1925. Both missions were at Darlington Point, on the Murrumbidgee River, south west of Sydney. "'Days of glory on our mission': These days were great on our mission. Our parents would teach us how to swim and play rounders and marbles with us". Signed l.r. corner, pencil “Roy D Kennedy”. Not dated. Roy Kennedy’, How soon they forget: the art of Roy Kennedy , ‘Works, pg. 49-52, Australian Capital Territory, 2009, 50.